Today we are talking about the model which is considered as the one of the most attractive crossover SUVs on the market. It is the all new 2018 Mazda CX-5. The CX-5 has been majorly refreshed as the 2017 model year when it brought many upgrades. This included redesigned exterior, more luxurious cabin and upgraded tech features. As well, its platform has been slightly revised which provided lower center of gravity making it more stable on the road. So, for the 2018 model, we will see just some minor changes since there was no need for anything major this time. On the other hand, what will be the biggest news is that the upcoming CX-5 will receive the all new diesel engine under its hood. Its main competitors on the market will include Toyota RAV4, Honda CR-V and Kia Sportage. The 2018 Mazda CX-5 will come with two types of engines under its hood. So, the base will be a 2.5-liter 4-cylinder turbocharged unit. This engine will be able to develop 187 horses and 185 pound-feet of torque. It will pair to a six-speed automatic transmission since the manual gearbox has already been discontinued for 2017. As well, the previously base 2.0-liter engine will also not be available this time. Moreover, the new Mazda will be available with front- and all-wheel drive configurations. As for the fuel economy, it gets 24 mpg in the city, 31 mpg on the highway and 27 mpg combined with FWD. With AWD, it is rated at 23/29/26 mpg. The next option will be the new diesel engine. It is a 2.2-liter 4-cylinder turbodiesel Skyactiv-D engine. This powertrain should be able to produce around 170 horses and around 300 pound-feet of torque. The six-speed automatic will be standard for this unit too. Like we have mentioned earlier, the CX-5 represents one of the best-looking crossovers on the road. 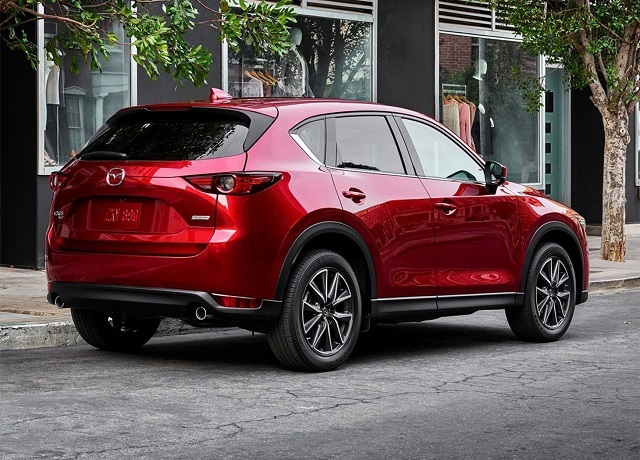 It has been fully refreshed last year, so the 2018 Mazda CX-5 will continue with the same design. The front fascia features three-dimensional grille, elongated LED headlamps and lower, sleeker hood. Furthermore, the rear end is more rounded than before and features a bit smaller taillights. The Mazda rides on the standard 17-inch alloy wheels while the larger 19-inch ones will be standard on higher trims. Inside, the 2018 Mazda CX-5 will arrive with the same cabin design and equipment as the current model. It features quiet, cozy and spacious interior. It is able to welcome up to five passengers comfortably. The cargo space is also sufficiently ample but if you need more room, the rear seats are flat-folding. The dashboard features a 7-inch touchscreen with new infotainment system. As for the equipment, it comes standard with power windows, mirrors and door lock, Bluetooth, two USB ports, a rearview camera, audio system with four speakers etc. 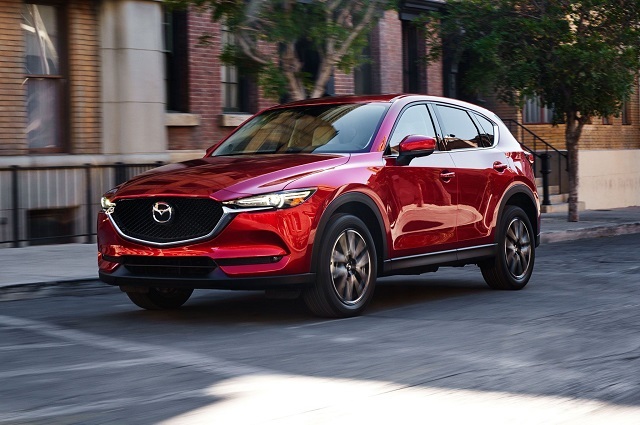 Speaking of the safety, new Mazda will be available with a safety package which includes lane departure warning, adaptive cruise control, automatic emergency braking and forward collision warning. The 2018 Mazda CX-5 should appear this fall. The price will be similar to the one of the current model. So, we expect it to start at $25,000 and it will go up to $32,000.